This thread is being dedicated to the lovely form of dendrites. Initially this began as an appreciation of manganese oxides, however I invite any kind of dendrites to be shared here. 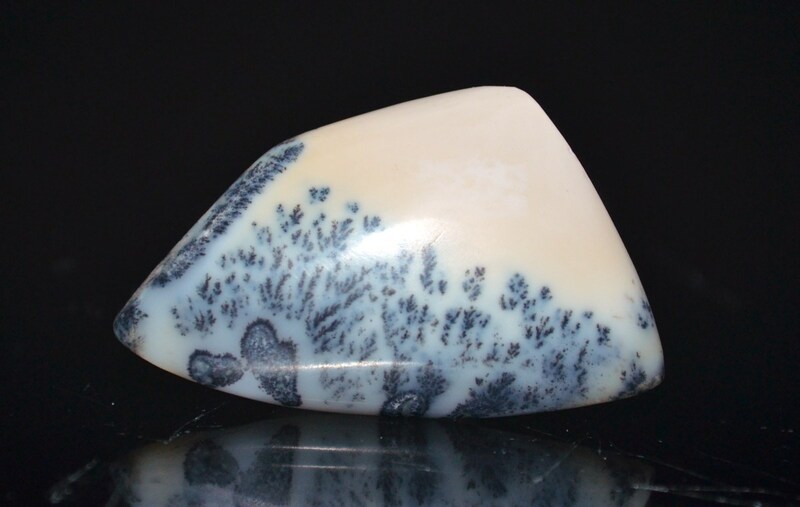 In addition since dendrites are well suited for lapidary purposes and are poplular as such, these are also welcomed to be shared here. Here are a few to start the parade. I left out Solnhofen deliberately since I am sure many of you would have wonderful ones to contribute and I would love to see them. This first one is from Utah, USA, if anyone knows a more specific location please let me know. Nice idea, Stephanie. Here are two specimens from Solnhofen. The first, as regards of the dendrites, is not exceptional but agreeable; a single, isolated, well defined and almost symmetric "branch". This is an occasion, however, to show a very nice Saccocoma pectinata (on the left), a probable larval crinoid typical of this place. 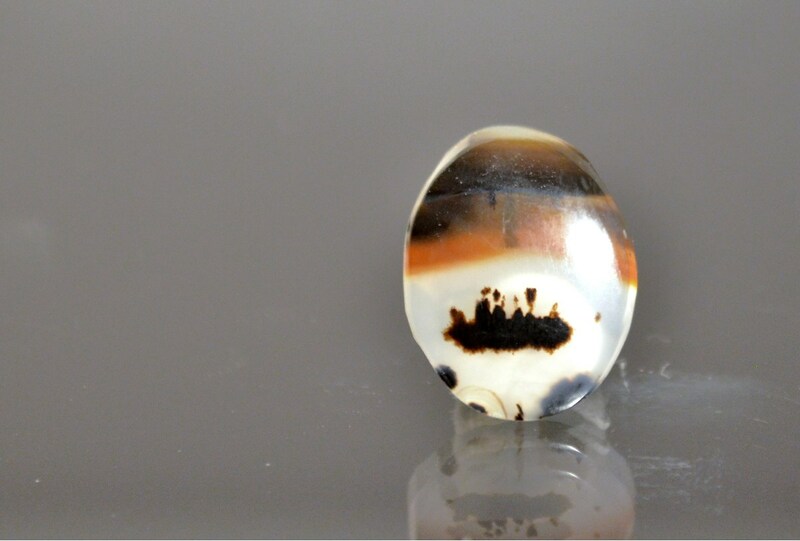 Its diameter is 26 mm. The second specimen is an ammonite (diameter 30 mm) crossed by well defined dendrites. I hope you like it. Why don't you write an article about dendrites? At the very least you should write up a better definition for our glossary than the one we have and show some more pictures of them. I think for many, was the first samples, we began to captivate. 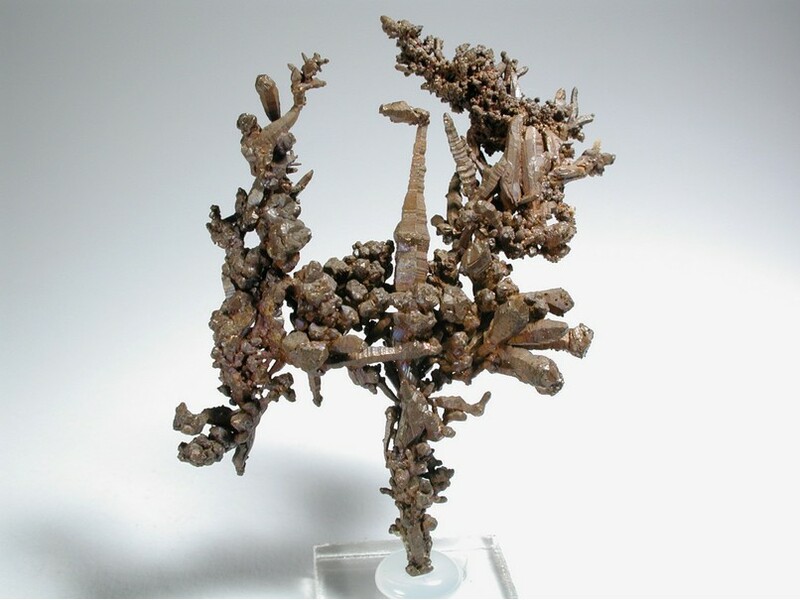 Here is a copy of manganese oxides from Jalapa Mine in El Molar, Tarragona, Catalonia, Spain. Beautiful examples and great topic! I hesitate to put this here because I am of course quite dubious that it's authentic. It appeared in Mineral Digest (vol. 5, Winter 1973) in an article by Roger Caillois, and well, it's interesting. The caption said it is limestone and the source is unknown and there was nothing else about it in the text. I'm curious if anyone has seen this piece and knows anything more about it. Edited 2 time(s). Last edit at 08/19/2012 03:24PM by Kelly Nash. This appears to be a dendrite of hematite. Perhaps it is hematite after a Mn oxide, but the rim of normal-appearing Mn dendrites around the hematite suggests the hematite was original. This was found at a fossil quarry in shale of the Middle Cambrian Wheeler Formation, House Range, Millard Co., Utah. There are trilobites on bedding surfaces in this piece. Edited 1 time(s). Last edit at 08/19/2012 04:01PM by Norman King. Steins Pass, New Mexico, north side of I-10, self-collected. Great stuff everyone! Glad to see there is interest. Kelly, that piece would definitley require more investigation. Rock, I will eventually put together an article, would like to see what interesting things may turn up on this thread in the meantime. 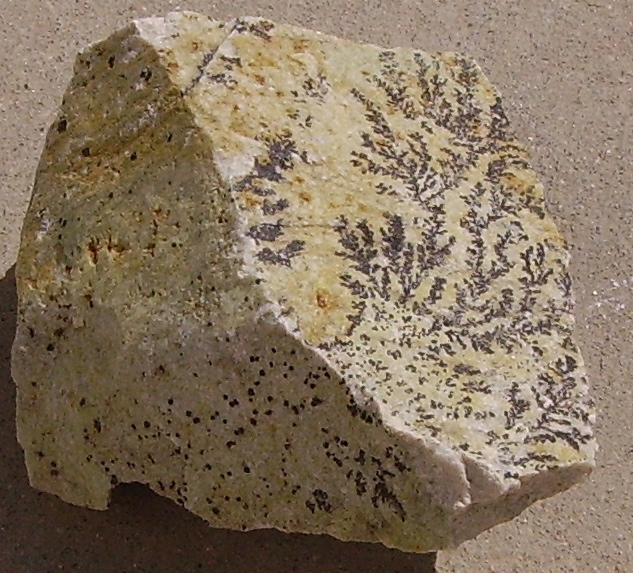 Now an example of the Canary Islands, dendrites of manganese oxides, found on the road near the village of Toto on the island of Fuerteventura (basal complex). I bet 99,99 % that this is not a dendrite neither a limestone specimen. It seems man made something like a drawing inspired in a limestone landscape and in the dendrites effects. Buildings, people, trees, birds, all in the right place... not natural for me. Edited 1 time(s). Last edit at 08/19/2012 09:20PM by Rui P Nunes. Rui, Those are magnificent. Could you please post more pictures from your collection? Stephanie, do these fit the definition of mimetoliths? While I don't have any worthy manganese dendrites, this fluorite pattern is reminiscent of dendrites. Edited 1 time(s). Last edit at 08/19/2012 09:17PM by Dean Allum. Thanks all for the continued contributions, hope everyone is enjoying them as much as I am. Dean, I would assume that they would qualify because they do resemble trees or ferns or such. And I do believe you have a worthy example of dendrites, and the spodumene they have formed on makes a nice contrastive canvas. 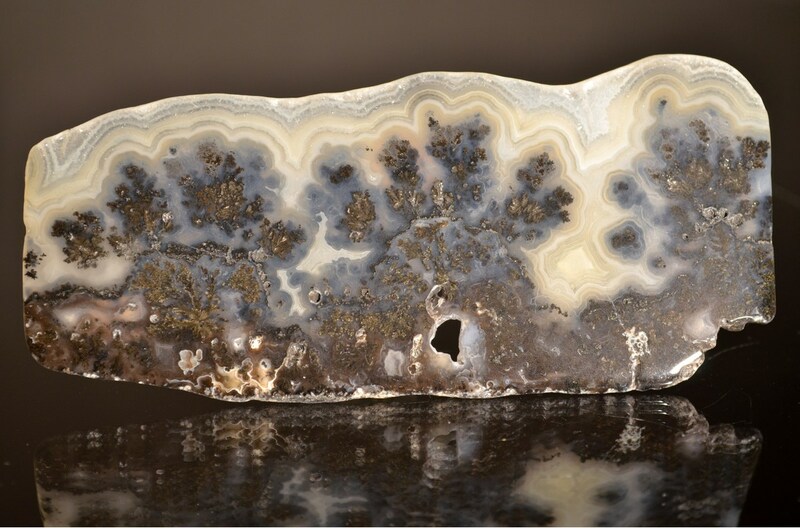 Don't forget about dendrites within/on agates. 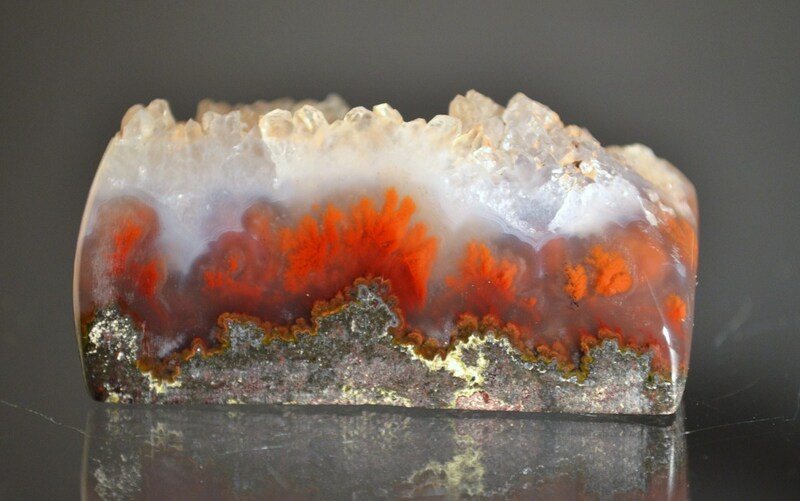 Here's one of my favorites: my dad had a junk Lake Superior agate, showing no banding or any other redeeming features. Tossing it into a bucket, it broke along its banding (which we call "peeling," as this typically occurs due to freeze/thaw cycles). Examining the two halves that had popped apart, I noticed this tiny 1cm dendrite hiding on the surface, where it had been formed in the microscopic space between the bands. Wow, What a great thread ! I have always loved Dendrites. This specimen has been in my collection since 1971. Edited 2 time(s). Last edit at 08/20/2012 04:04PM by Marc Miterman (2). I recently found some calcite crystals with distinct presumably manganese oxide dendritic growths on several of the crystal faces. I have found similar dendritic growths from several different locations, where they had been caused by solutions seeping between bedding planes, but i'm mystified how these particular dendrites could have formed. Has anyone else seen dendrites on crystal faces? Sorry no photos at present, all my specimens are in storage. here are some of calcites with probably manganeze dendrites on crystal faces. Specimen was all embeded in clay. The Mineral Digest was created by Julio Tangelof sp? who ran a company called Astros back in the 70s in New York City. He was notorious for never paying his bills and selling Mexican coconut geodes that cost $5 anywhere else but he was selling them for $60. His sales people often didn't know what they were selling and I doubt that he could identify more than 20 common minerals by sight.. The people he hired to run his organization knew even less. He was an egomaniac of the first order. The magazine was designed as an advertising vehicle and for his personal aggrandizement which shines through loud and clear if you read some of the articles that he paid a captive editor to have written about him and his wife by hacks. I should add that this is my personal point of view and that his descendants still run the business out of NY City today and might have an entirely different point of view. Thanks for the info Rock. Given that information we could discern that there is likely not much credibility/validity behind the publication regarding the piece that Kelly posted. I agree with Rui, it has too many things in the correct order. Rob, you say you "lost" those, I hope they went to good homes. Thanks for sharing your mementos. The Copper is on display at the Royal Ontario Museum and maybe the Gold is too. The Silver is in the dungeon there. Microphoto of Manganese Dendrites on Aragonite. FOV: 4 x 4 mm. From "Puesto Viejo" Quarry, Sierra de Puesto Viejo, Santa Bárbara Department, Province of Jujuy, Argentina. Specimen size: 12,7 x 9 x 1.8 cm. From Raco River, Trancas Department, Province of Tucumán, Argentina. Specimen size: 6.7 x 4 x 2.1 cm. From Salar del Hombre Muerto, Antofagasta de la Sierra Department, Province of Catamarca, Argentina. Specimen size: 7 x 4 x 2,3 cm. From "Loro" River, Burruyacú Department, Province of Tucumán, Argentina. Dendritic manganese oxides on schist. Specimen size: 19.5 x 11 x 0.5 cm. Raul ~ Wonderful pieces. Nice to see from Argentina! Tom - regarding growth on crystals, I think it depends on the type of crystal and the environment in which the dendrites form. 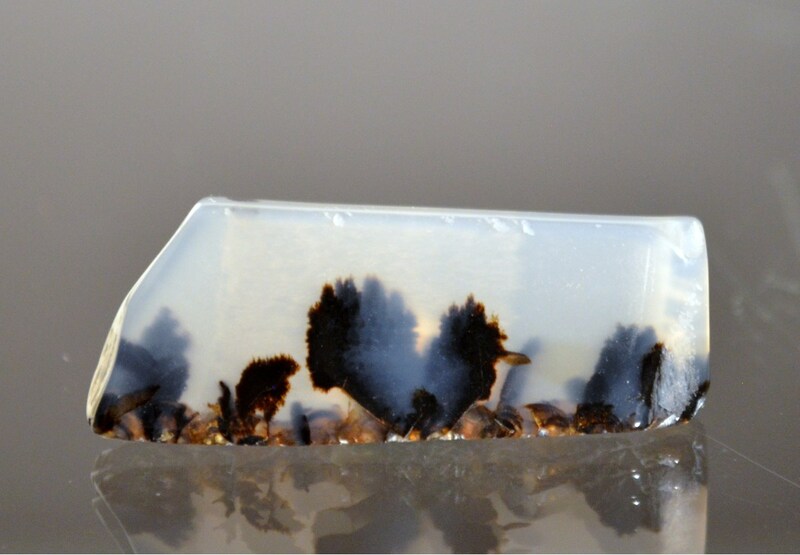 Dendrites are seen frequently on feldspars and I think it might have to do with the actual surface of the crystal. Certainly they seem to like more porous surfaces, perhaps that is a coincidence based on the nature of the deposits where they are more typically found. But you are are right, you don't see them much on gem type crystals, more in them than on them, especially quartz. 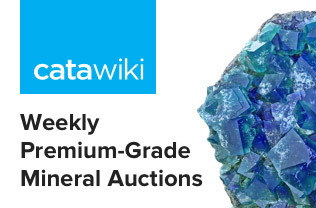 I suspect this might have to do with secondary deposition conditions and these don't seem to favour them forming and adhering to gem crystals in their environs. Here is a feldspar with some incipient dendrites in what I call the blotchy stage. 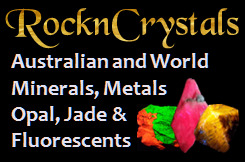 Dan, yes agates, jaspers, opals et all are definitely welcome. I really don't know where to start! I am hoping that others will share such natural art. 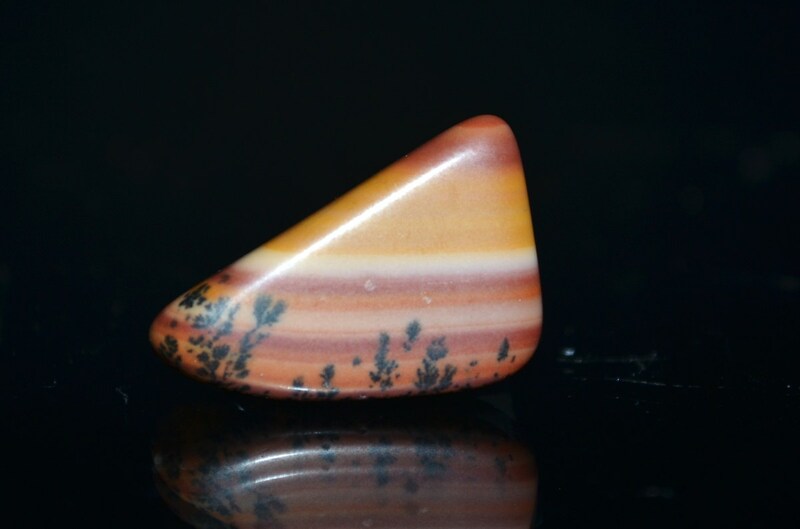 There has been a lot of this Chinese jasper out there, they look so much like paintings, so I had to get one of course. 10 x 4cm. And the great thing is that it has two sides that can both be displayed, which side to choose? Or should I get one of those spinning frames? LOL. 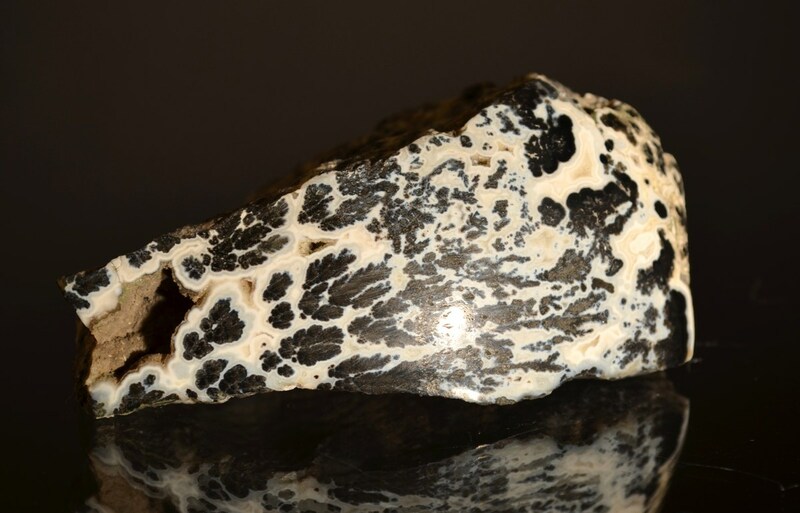 All these specimens are fantastic, I really find myself liking the white with black dendrites from Portugal, very striking! 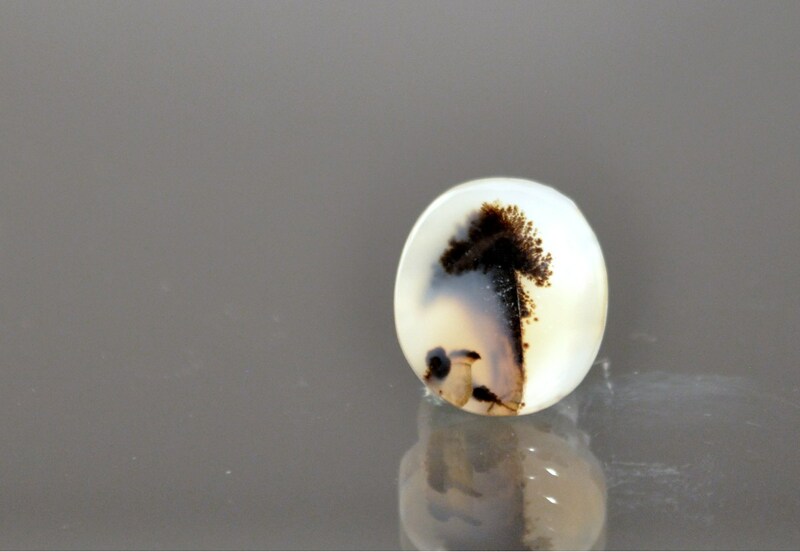 Here is a lemon opal dendrite from the Knoxville Recreation Area north of Napa California. FOV: 10 x 5 mm. 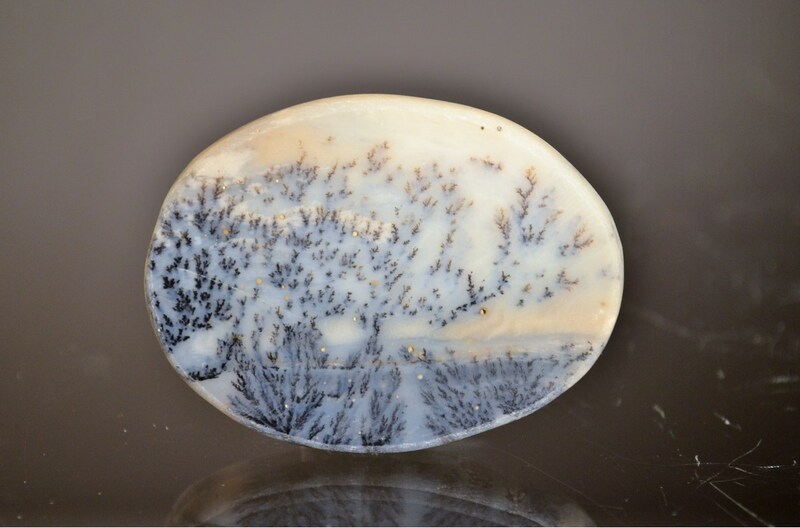 Beautiful dendritic massive specimen of Native Copper with Quartz Cystals included. Specimen size: 9.5 x 9 x 4.6 cm. From Copiapó, Copiapó Province, Atacama Region, Chile. Specimen size: 10.5 x 6.5 x 6 cm. 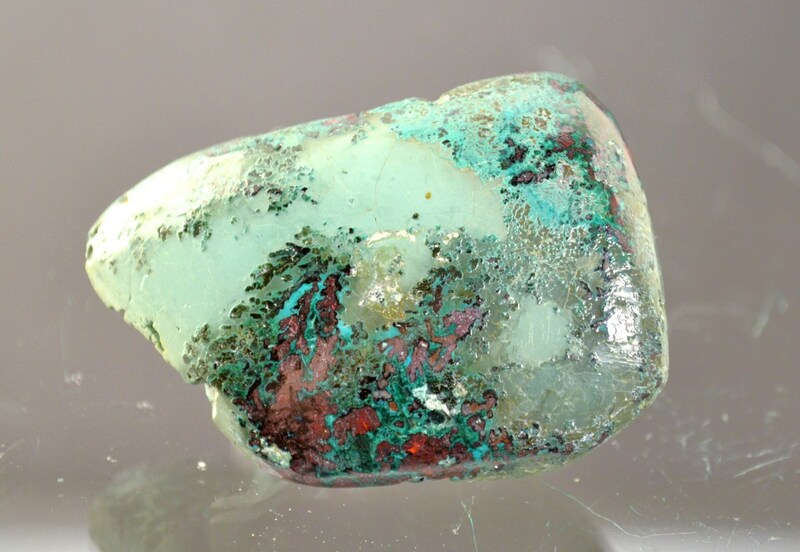 Very nice sample of Dendritic Native Copper with flattened crystals and Malachite covered. 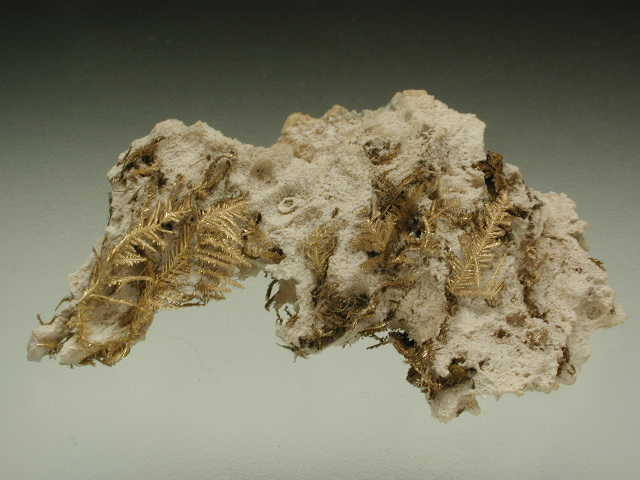 Specimen size: 5.6 x 2 x 1.1 cm. From Osceola Shaft # 10, Calumet, Houghton County, Michigan, U.S.A.
Edited 1 time(s). Last edit at 08/26/2012 03:03AM by Raúl Jorge Tauber Larry. 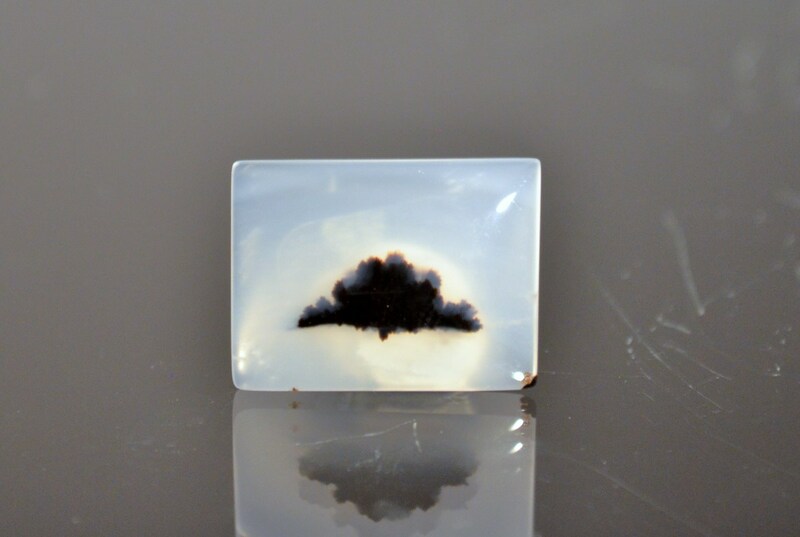 Beatiful Dendritic Psilomelane. It looks as branches of tree. Specimen size: 7.5 x 6 x 4.5 cm. From La Providencia Mine, Susques Department, Province of Jujuy, Argentina. Very nice Raul, thanks for sharing. 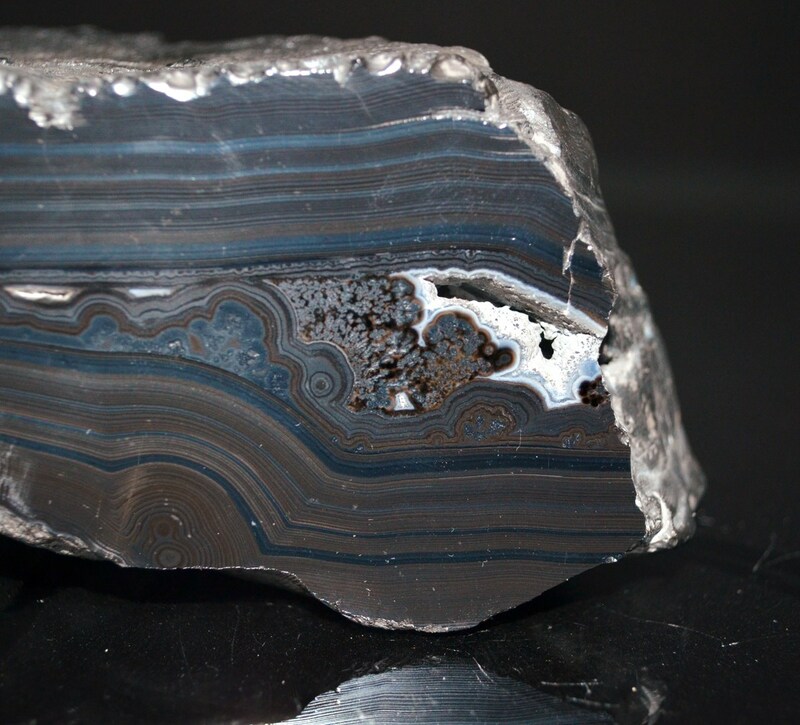 I really like the psilomelane. Here are some cryptomelanes. I have posted these before but couldn't resist posting again for the dendrite cause. The next two are from the same location, Czech Republic. 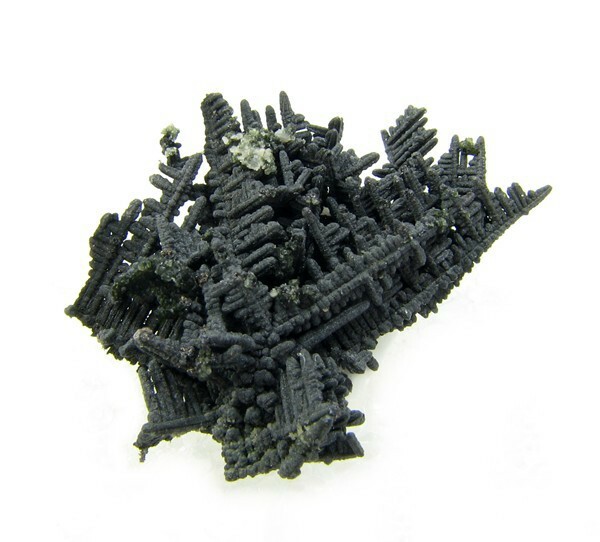 I want to grow my own manganese oxide dendrites. They seem to be natural fractals, and I have a hunch that they grow quickly and, as Bacteria Bart, I think there is an organic aspect to their formations, but I have never heard of mangenese metabolizing bacteria. I tried an experiment. I crushed up some dirty manganese oxides, emusled them in rainwater, moistened some microscope slides in the suspension and waited almost a year for something to happen. Nothing happened. It seems as though they most commonly form in fractures in carbonate rocks. I wonder it those carbonate rocks are most often manganese bearing. My next effort will be to create some little slabs of manganese bearing carbonate rock, join them, and put them in dirty rainwater and leave them alone for at least a year. Are there non manganese oxide examples of dendrites ? Bart - an important factor in the growth of dendrites is surface tension, that's why I don't think they grew on your slide, or why they don't grow on many well developed gemmy crystals. The surfaces do not have enough "gription". There are a number of factors hat have to be just right for them to grow and it is my observation that porous rocks such as carbonates are a better host. These are usually sedimentary in nature, or weathered granitic formations where the environmental conditions exist suited for the growth of dendrites. There may be an organic component which is being studied. Yes, there are other dendrites besides manganese oxides, iron oxides would probably be the next most common. And yes, they are natural fractals. Edited 2 time(s). Last edit at 08/26/2012 04:25PM by Stephanie Martin. I can't tell if your cryptomelanes are beautiful or creepy. I'll stick with fascinating. I have an intuition that dendrites form by capillary activity (wicking). 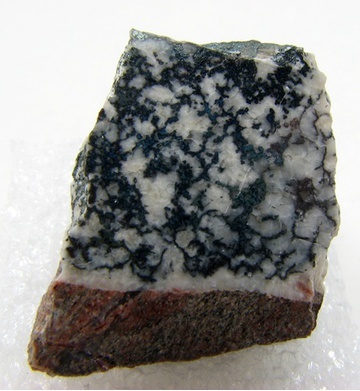 My next experiment in growing my own dendrites will be to split some fine grained carbonate rocks and bind the pieces back together rather than ginding and mating some small slabs. That should improve the "gription" and improve my chances of becoming the first dendrite artist. A goal with no practical value. My specialty. Maybe I'll use some weak manganese sulfate solution with the rainwater. Re: "a goal with no practical value" - I don't know about that, Bart. The psychologists could use them for Rorzhak (sp) tests. That's very funny, i retract my statement about no practical value for dendrites..
A completely natural and random source for Rorschack images. I will would work on Rorschack pairs during first day of retirement. Except that would be a day after I'm dead. I don't know how to spell that guy's name either. 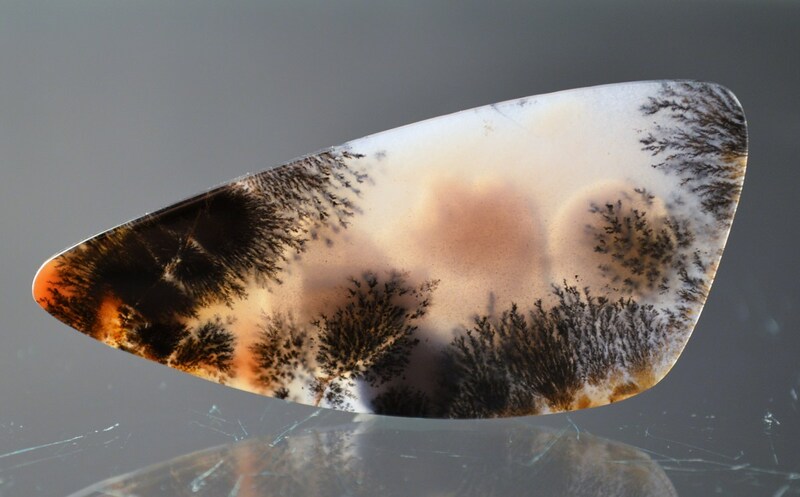 I seem to think that Ruggles Mine uraninite, gummite specimens show a dendritic nature. The difference between dendritic and arborescent features would seem to be two dimensions vs. three dimensions. Wicking may be a factor in the creation of surface dendrites as per your instinctual hunch. And FYI the correct spelling is Rorschach. I would think that inkblots are essentially fractals as well. a-HA! - Answers a question that I've been pondering since the start of this thread - thanks, Bart! 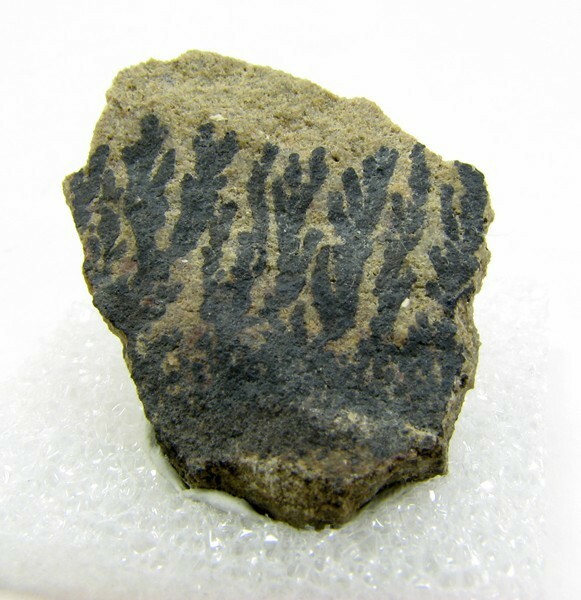 The Handbook of Mineralogy describes the crystal habit of berzelianite as "thin dendritic crusts"
Dendrites, eh? Ok, here we go! 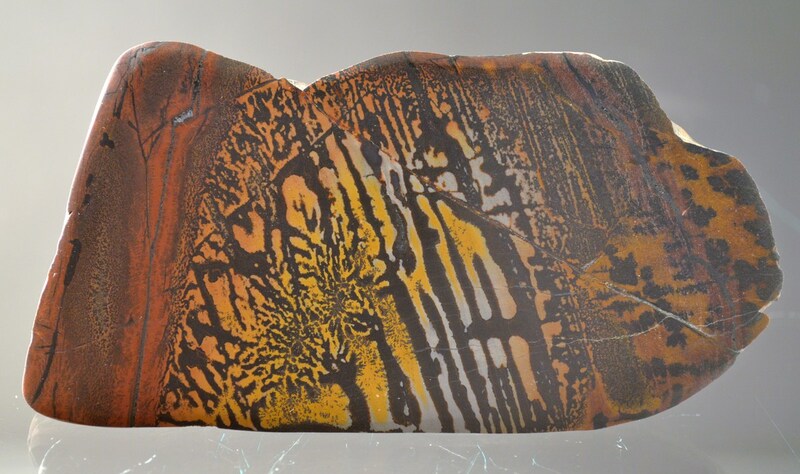 The display face of this specimen has been cut and polished to show off the dentritic effect. Maggie that berzelianite is really cool polished like that. Striking piece! Here's another featuring arborescent copper in gypsum. I have always loved dendtrites. I started gathering them up but quickly over ran my daughter with things to photograph. These arborescent silver crystals are covered in micro safflorite crystals - leaves of silver for accent. I love the structural aspect of these specimens and they LOVE to be photographed. 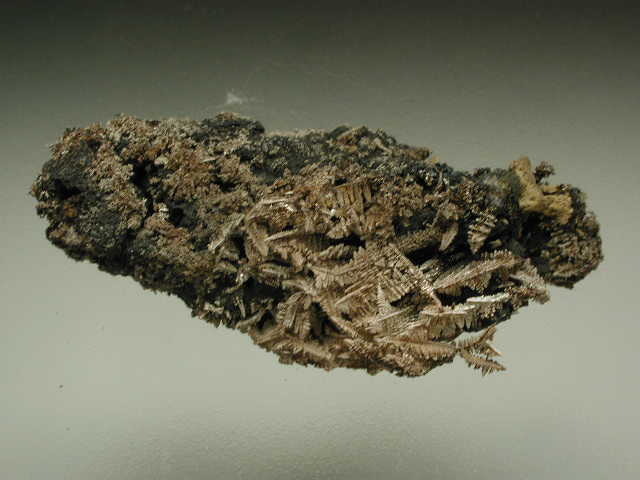 Manganese oxyde dendrites self-collected, from Argentinia. I know I am in my own little world, but everyone knows me here. These malachite dendrites are very prolific at the mine. They are on sandstone and are about a thick as a hair, maybe thinner. Here's a local one for you Steph - a thumbnail of manganese oxides from the DeForest Quarry, near Inglewood, Ontario. Here is a photo of some Dendrites in translucent Quartz I collected from an unnamed Feldspar prospect in Center Minot,Maine. It is about 9 X 6 CM in size and the Dendrites are both on the surface and along internal fractures. Many great photos of Dendrites on this thread. Edited 1 time(s). Last edit at 08/31/2012 03:03PM by Clifford Trebilcock. Nice to see all the great contributions! Alexis that is a lovely find, definitely a keeper. Rick - thanks for sharing so many, you made my day. Maggie – a nice local surpise, and from a location that is usually known for orange celestite. Just wonderful! 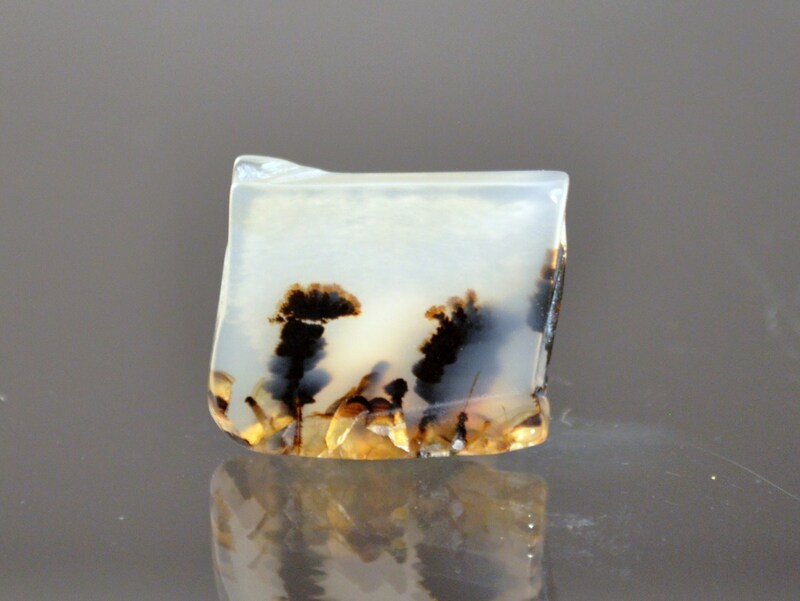 Cliff, that is a stunning unspoiled dendritic quartz! Hope you plan to keep it that way! More on opals. 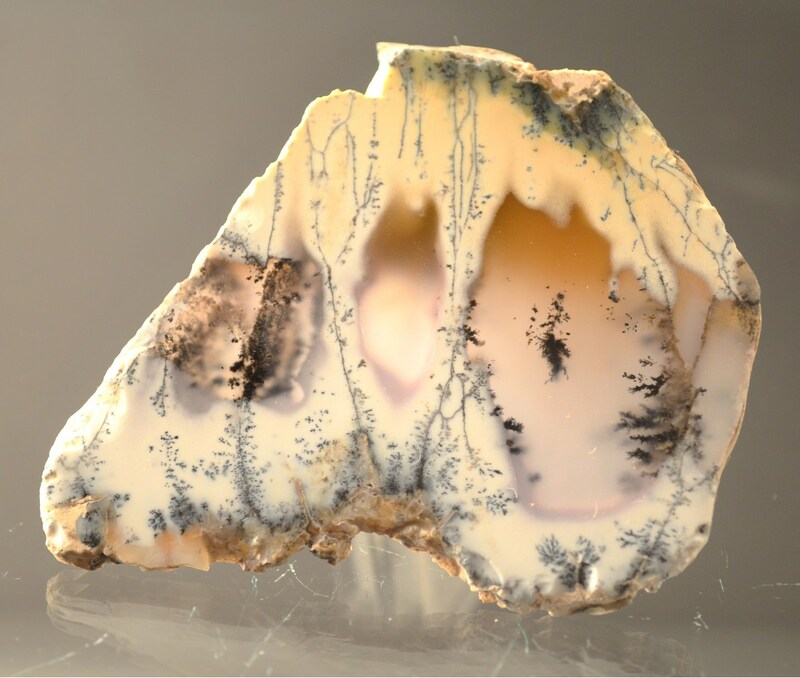 You often see this material used for cabachons, pendants, earrings etc, but I just find the centers are fascinating on these dendritic opal nodules from Turkey. The chalcedony layer adds some interesting contrast and is fluorescent. Hey Steph, whaddya think of this one? That's a beautiful specimen! It's good to see that you have finally developed an appreciation for mineralogy and some healthy curiosity. Edited 1 time(s). Last edit at 09/01/2012 11:52PM by Dean Allum. I think you're confusing "appreciation" with "aesthetics". I actually have both. What I seem to be missing is good judgement. Apologies; it didn't occur to me that I would cheat you by posting your picture. 4 pages of posts went by and I never saw it. I was under the impression that this was all about knowledge for knowledge's sake. 2. There's always a danger with the written form of communication for miscommunication to occur. For my part, I apologize for having taken the liberty of assuming you would find my clownish actions amusing and in good spirit, instead of insulting. You can be assured I won't take such liberties in the future. Especially now that it seems clear that all I'm doing is making an idiot of myself by having to post a public apology. Manganese Dendrites on Feldspar(Albite-Anorthite Series). FOV: 5 x 4 mm. From Pegmatite of Milagro Mine, Cerro Pichao, Sierra de Quilmes, Tafí del Valle Department, Province of Tucumán, Argentina. FOV: 5 x 5 mm. Manganese oxides dendrites on feldspar(Albite-Anorthite Series). From pegmatite of "Milagro" Mine, Cerro Pichao, Sierra de Quilmes, Tafí del Valle Department, Province of Tucumán, Argentina. FOV: 4 x 5 mm. Edited 1 time(s). Last edit at 09/02/2012 05:12PM by Raúl Jorge Tauber Larry. John, I was actually rather amused that you posted my photo. But I couldn't resist the return barb. And actually I imitated you as well, by using words from your original post. So I guess you didn't pick up on that, but as you said the written word can sometimes be difficult to impart nuances. Regarding the specimen, I was going to get around to it posting it again eventually, but it was nice to see it. I have enough dendrite material to post one everyday for the remainder of the year if I wanted to, but will spare you all from that overkill. LOL. Let's get back to dendrites! Maggie, here is another from Ontario, but alas there was no other locality information with it. Roger, thanks for posting that in situ photo. I appreciate that you took the time to notice it there and snap the pic. I was hoping to see dendrites from uncommon places, and you measured up to that expectation nicely. Hope you were able to find some arsenopyrite too. 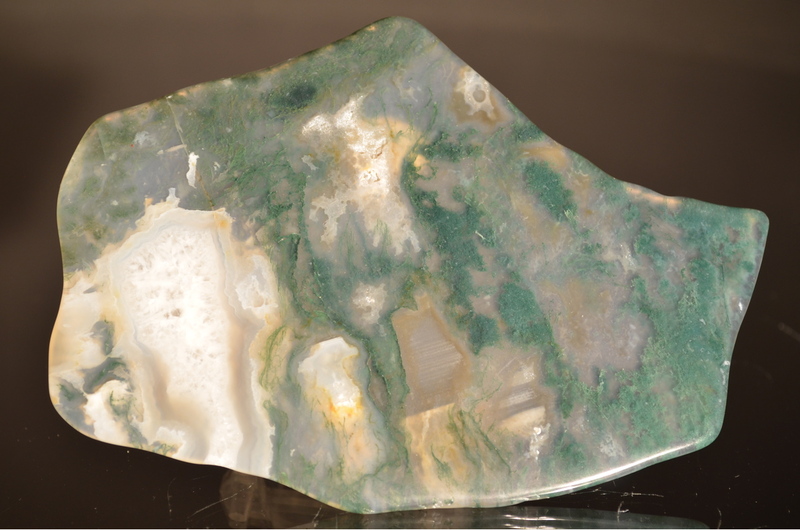 Today a little piece of jasper-like material known as opalite from Australia. 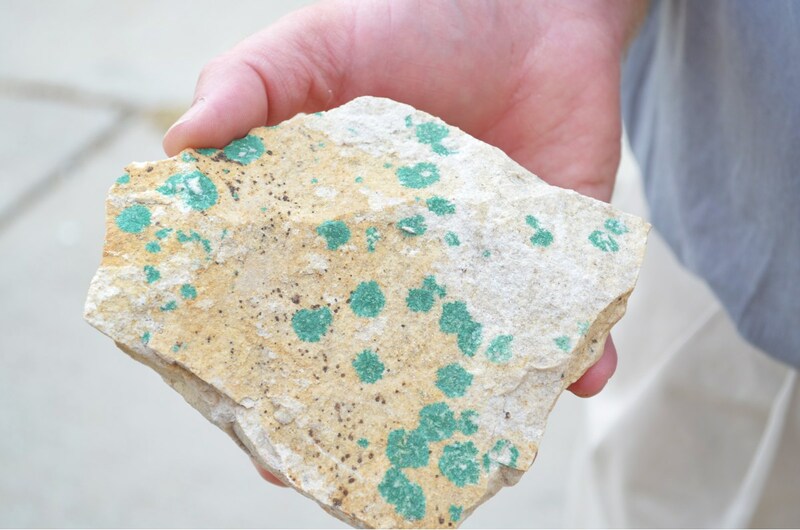 The information I have says it is found in the opalite mines not far from the Yerilla Chrysoprase Mines in the Goldfield Esperance region, Western Australia. Thanks Roger, Is that growing in micro gravity? The horizontal growth is faster than the vertical in the photo. Rob, I think this link explains it. This is usually a result of heat and cooling rates. Thanks Stephanie, but I think Roger has a different specimen. His has both horizontal arms. In microgravity the growth should be the same in all symmetrically equivalent directions. Flames are spherical until the local oxygen is exhausted. So maybe I've answered my own question since the vertical growth is not as fast as the horizontal. Cool pictures, Thanks. Yes, that's what I was getting at. If it was in micro-gravity, the growth should be symmetrical. I agree, It is a great little gif.